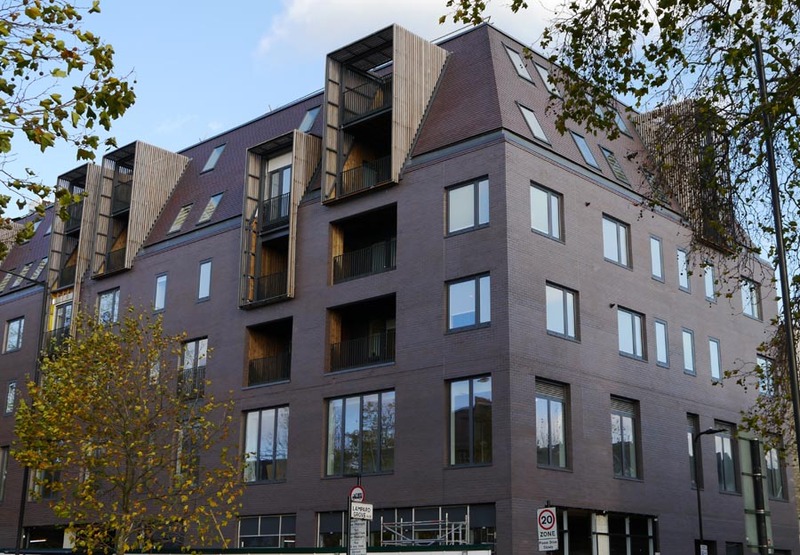 This mixed use scheme of residential apartments and office and retail units in North London was built by Tolent Construction and uses Ketley Brown Brindle facing bricks for the walls and matching Blue Brindle clay tiles from Dreadnought for the roof. The existing residential blocks in the area which define the character of Stamford Hill date from the interwar period and are simple red brick facades with steep pantiled roofs and distinctive chimneys. This project was developed by ISA Architects, but planning consent was originally obtained by Stockwool Architects, who wanted this new scheme to draw on some elements of the existing buildings without copying them. They designed a scheme where the clay roof transitions seamlessly into the brickwork of the walls and this was achieved by using a matching clay roof tile and brick and incorporating secret gutter detailing at the eaves. Large bay window balcony frames have been incorporated and these project from the smooth, clean roof lines breaking up the roof form and echoing some of the features of neighbouring buildings. The overall effect is to create a highly contemporary building that fits well with its existing adjacent neighbours.